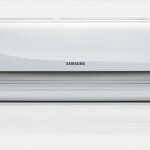 AIR CONDITIONERS AND HEAT PUMPS are increasing in popularity every year. Air conditioned offices and transportation have made us less tolerant of the heat as well as the fact that many of us live in apartments and condos which heat up like greenhouses during the summer. Heat pumps are like air conditioners except that they can reverse their operation and provide heat during the winter. This type of unit have a 30 to 45 inch wide air handler which is 12″ high and about 8 inches deep. This unit mounts high in the room to be cooled. This unit quietly delivers the cool air into the room. Outside there is a compressor which rejects the heat that has been absorbed from the indoor unit. 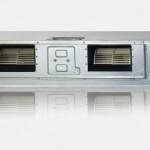 This unit is good for applications where you want to cool one,two or three rooms, but not necessarily the whole home. It is also good for condos or apartments depending upon strata approval. Air conditioning can be added to your existing forced air heating system by simply adding a coil on top of your furnace and installing an outdoor compressor. 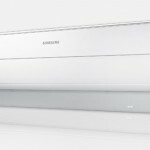 Alternatively, if it is not practical to do so, or you have hot water heating and want to add central air conditioning, you have the option of installing a hi-velocity ducted air conditioning system. This system used small diameter ducts that can be installed into attic spaces and can be installed through the stud walls down to the main floor as well. 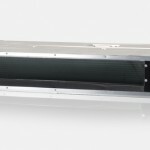 It is a way to get central cooling without having to tear apart your house to install ducting.